Our customer service staff was pleasantly surprised last week by the amount of phone calls they kept getting in response to our Dream Designs e-newsletter about tiny house plans. Since our designers and architects have a large selection of small house plans, we decided to put together a collection of tiny house plans, featuring every house plan in a wide array of architectural styles that is less than 1,000 square feet. 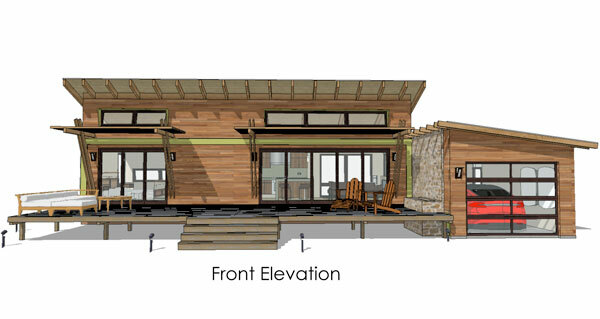 The Snowbird House Plan 9408 is one a contemporary tiny house plan clocking in at 480 s.f. Whether it’s a waterfront vacation retreat, a cottage you’re building to use as in-law quarters or a small home to minimize the ever-increasing heating, cooling and maintenance costs, this collection has everything you’ve been looking for including garage plans that incorporate studios and smaller living quarters. Because a tiny home costs less to build, own, clean, heat, cool and maintain, you can enjoy the freedom to enjoy your lives. Lets face itâ€¦ the less money you need to run your home, the less stress of earning more money and the more time you have to enjoy your favorite things. Enjoy browsing through are recently launched collection of tiny house plans.